With summer rapidly approaching, more and more people are looking forward to sunny days and high temperatures. During summer months, there are countless activities you could do with your friends and family. However, most people enjoy spending time near the water. It doesn’t matter if it’s a lake, sea, or maybe a river; everyone will have a great time. Water trampolines are the ultimate source of fun; they will become everyone’s favorite summer activity in no time. Furthermore, they are a great way to exercise and have fun at the same time. If you happen to see a water trampoline for sale this spring, hurry up and buy it; you will have the best summer ever. Water trampoline for pool or for lake? Where can I buy a water trampoline? How to inflate a water trampoline? Can you use a water trampoline on land? How do I move a water trampoline? Can Water Trampolines be used in salt water? Can water trampolines be left in the water? Bouncing, diving, and swimming are beneficial activities which will amuse you all day long. Water trampolines are suitable both for children and adults, so if you are looking for ways to spend more time with your family, think about investing in a quality water trampoline. Picking the best one can be hard if you are not familiar with them. Luckily, I know all there is to know about them, as I tested many kinds, and I will gladly help you to pick the best one for yourself. Without further ado, here is the list of best water trampolines, with key features, users’ reviews, and pros and cons included. This Bounce and Splash can accommodate multiple children at once, and provide a lot of fun. Also, while nearly all water trampolines require assembly, this bouncer doesn’t. All I had to do is inflate it, and that took only ten minutes, which is great. Finally, when you buy this bouncer, you get one of the best limited warranties on the market. 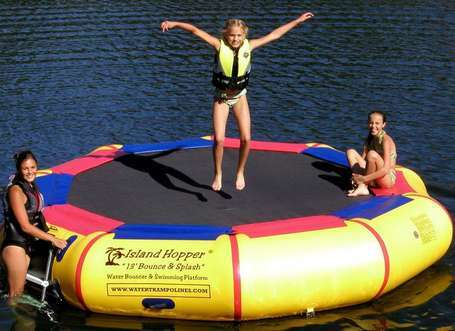 Most users claimed that the Island Hopper Bounce and Splash 13 Foot Bounce Platform was as high-quality as described, and were satisfied with it. Since it isn’t a regular trampoline, you shouldn’t expect to be able to perform aerial tricks, though. It is perfect for children, to jump off and have fun on it. Moreover, the manufacturer provides a fast delivery and efficient customer support. Those who had some concerns and troubles with it claimed to be satisfied with the way their problems were handled. The Island Hopper 10’’ is made from the same material as the 13 foot one, which also makes it durable and heavy-duty. It comes with a 5-year “No Blow-Out” limited warranty, and it is for bouncing only. The exclusive ½’’ perimeter provides both comfort and safety. It rises 23” above the water and has a jumping surface of 7’6”. 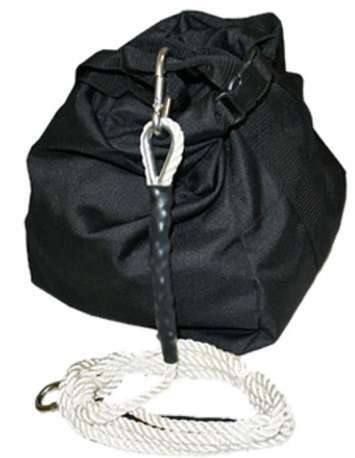 There are 8 swimming-assisted handles, 6 D-rings which are to be used as anchors, and a 4-step ladder. It weighs only 55 pounds, and its maximum weight limit is 300 pounds. Most users buy it for their kids, and they claim to be extremely satisfied with it. Taking its size into consideration, it isn’t really suitable for adults, at least not for jumping. However, the youngest ones are going to love it. Also, you can fit it into your pool too, as it is not too big. The Island Hopper 17’’ is perfect for those who want to go bigger. This model also comes with a 5-year limited warranty, and it’s as durable as the previous two models. You can use it both as a swimming platform and a water bouncer. Just like the other models, it is springless and has an interlaced nylon webbing mat. Users claim that it is fairly easy to open and fill. Due to its size, filling might take up to 30 minutes, depending on what you use to fill it. Also, bear in mind that this isn’t a trampoline, but children can still jump rather high because this bouncer is pretty big. Some customers were annoyed by the fact that they had to refill it a bit every day, as it tends to deflate during the day. The Island Hopper 25’’ Giant Jump is a water trampoline you don’t see every day. This water trampoline is enormous, and that’s what sets it apart. It provides a giant surface area, and a number of people can have fun on it. With a steel frame, springs that are cross-tapered, and 20 frame tie straps, it was designed as a true trampoline. Needless to say, the same 1100 Denier PVC material is used on this model too, again, to ensure durability. Make sure that you have enough space in the water if you plan to buy the 25’’ Giant Jump. Since it is so big, accessories are almost obligatory. It comes with 2 aluminum ladders; and the most popular accessories are the Bounce N Slide, Island Runner, and Double Blaster. If you have the means and space for it, you should know that this water trampoline with a slide is the ultimate choice. 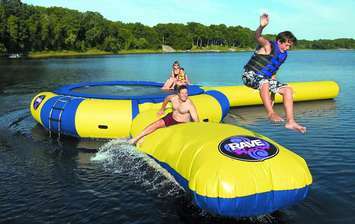 The downside is that the RAVE Sports Aqua Jump Eclipse requires more attention and time than water bouncers. It might not be a bad idea to have it installed since the process is somewhat complex. 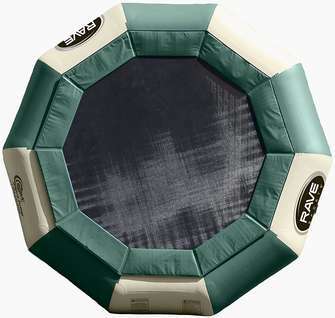 You need to assemble the trampoline, deal with the inflation/deflation pump, and put multiple accessories into place. This product also comes with a limited lifetime warranty. If you have your eye on this model, hurry up. They sell out quickly. A 48’’ platform for boarding is equipped with handles that make boarding easy. The material used is heavy-duty PVC. Also, while some models have problems with water residue, the Rave O-Zone doesn’t. Big drain holes in the base prevent water from staying in the center. To be honest, water trampolines are rather pricey. So, before buying one, you should think about your needs and preferences. Here are some things that helped me choose the best water trampoline. As you probably noticed from the review, some of these water trampolines have springs, while others don’t. The ones that use springs are typical trampolines, and those connected directly to the frame are bouncers. They are very similar, but not the same. The main difference is this: trampolines are bouncier because of the springs. On the other hand, bouncers are a bit stiffer. You can’t bounce as much, but you can relax in the sun. So, ask yourself what you expect from your water trampoline, and the choice shouldn’t be too hard. If you are buying it for your kids, they will probably prefer to jump as high as possible, though. This is a very obvious matter, but somehow it is often overlooked. Many people are drawn to design, accessories, price, etc. and they simply forget to consider the size. To avoid potential problems, make sure to check the size before deciding on a water trampoline. Bigger isn’t necessarily better when it comes to these fun products; they occupy a lot of space and can be hard to assemble and transfer. However, if you have a big family or a wide circle of friends who love to have fun on the water, maybe you do need a really big one. Think about how many people are going to use it and keep that in mind when going shopping. 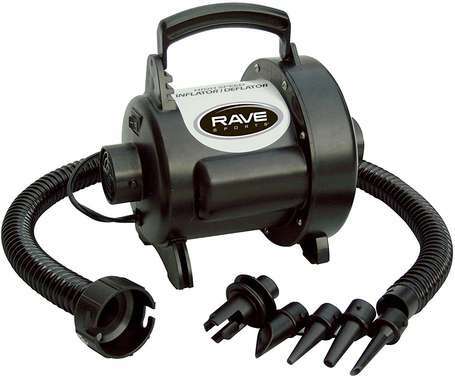 Accessories can be really useful and will provide extra enjoyment on the water. 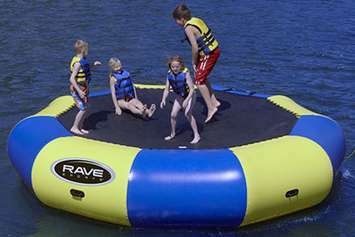 If they are not included in your water trampoline, they might be expensive to buy separately. Having a ladder is always good, as many people have trouble climbing when they are wet. Handles can also come in handy when you need some extra help to access the trampoline. If you have kids, make sure to have a slide for them, as it makes a big difference. Also, an anchor is much needed to prevent your water trampoline from drifting away, especially on a lake or river. It is no one’s idea of fun to spend hours on the set-up. Check how complicated the assembly is before you buy a water trampoline, as this will save a lot of time, energy, and frustration. Also, make sure you have enough storage room for it. When the summer season is over, you will have to put it in a suitable place until next summer. I talked a lot about materials in this review, and for a good reason. The material is indeed important. High-quality materials can make all the difference and secure a long life for your water trampoline. Make sure that the material is durable and has some sort of protection from the harmful UV rays. Getting some sun, a bit of exercise, and having a blast with your friends and family sounds like the recipe for a perfect summer. With the best water trampoline, this can quickly become a reality. Consider your needs and think about your expectations, and you won’t make a mistake in your search. For those who are looking for something exciting and new, water trampolines are the real deal. Options are numerous: big, small, bouncy, for kids or adults, with a bunch of accessories or not, it is up to you. Prices also vary a lot depending on the size and attachments. If you don’t want to overspend, try to find a water trampoline for sale; there are cheaper options too. Most of us are familiar with regular backyard trampolines, and many families already have one in their own home. 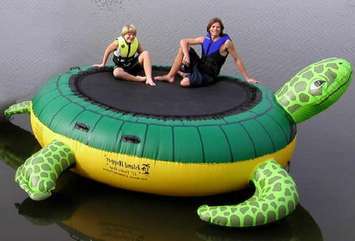 However, you may be surprised to learn that you can purchase trampolines for use on water. Buying an inflatable water trampoline or a trampoline raft can be a great way to have even more fun in your pool. They are also a great way to encourage your kids to exercise while having a blast at the same time. So should you invest in a water tramp? Read on for our handy guide. 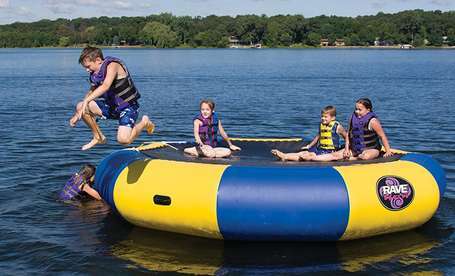 You can use a water trampoline or trampoline raft most safely in a lake lake. Using it in a pool is more convenient for many families, but it can be very hazardous. You would need an enormous pool as it needs to be in at least 8ft of water and 15ft away from the edge. 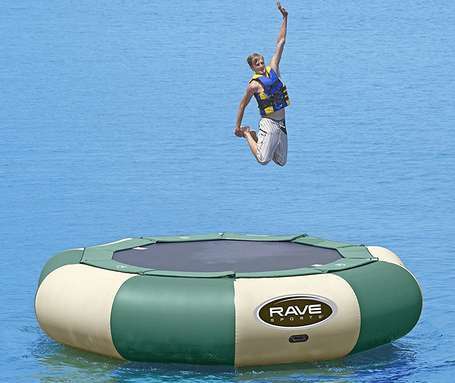 Therefore, the most likely scenario is that you will be using a water trampoline on a lake. If you choose to use your water trampoline on a lake, check first to make sure that it is allowed. Also, it's extremely sensible to use a water trampoline anchor to prevent the trampoline from floating away. This could be very dangerous if there are people on it. We'll cover water trampoline anchors in more detail later in the article. If you choose to use your water trampoline in the ocean, it's extremely important to anchor it very thoroughly. Strong currents could carry your water trampoline away very quickly which could pose a great danger to anyone using it at the time. Water trampolines are great fun, but they also come with a hefty price tag. You can expect a water trampoline with a spring construction to cost upwards of $3000. However, a water bouncer is considerably cheaper. Most models cost somewhere in the range of between $1000 and $2000. If you are considering buying a water trampoline, you may also wish to invest in some attachments to make your inflatable water trampoline even more fun. Here's a quick run-down of some of the most popular attachments for a water tramp. You may have seen these attachments at professional water parks. They are a large inflatable pad that floats on the water. One user sits or lies on the trampoline launcher while another jumps on the other side, launching the person into the air to land in the water. This can be great fun for older kids and adults who are strong and confident swimmers. Bear in mind that you will need plenty of space to use this safely. Unless your pool is enormous, you will need to have access to a lake. A ladder is a great attachment for your water trampoline as it allows easier access to the trampoline. This can be especially useful for helping younger kids on and off the trampoline safely. Some brands of water tramp offer ladders specially designed to fit. These slides are usually inflatable and can be fitted to the side of your water trampoline or trampoline raft. This allows you to have fun sliding into the water from your water trampoline. Make sure that the model you're considering will fit with your inflatable water trampoline before buying. Whilst the name may sound bizarre, the moniker 'water blob' actually suits these trampolines quite well. 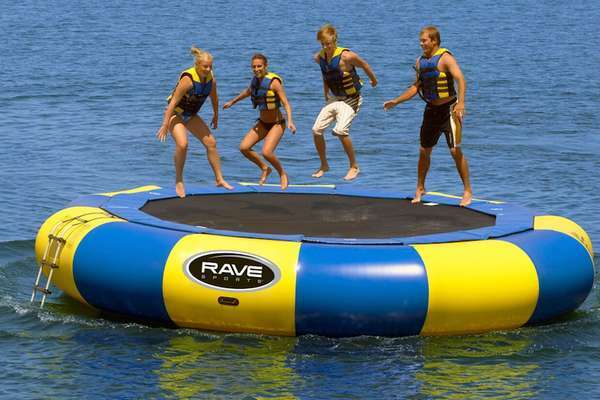 They are to put it simply a large i﻿﻿nflatable plastic 'blob' that you can jump on in the water. They do not have a jumping mat. Instead, you jump directly on the inflated plastic surface. If you've ever been to a bouncy water park, chances are you've already used an inflatable water blob as these are very commonly used in leisure parks. If you want to purchase your own water trampoline, you can purchase some brands online easily on Amazon. As you can probably imagine, manufacturing water trampolines is a pretty niche business. Therefore, there are less manufacturers offering inflatable water trampolines than there are regular trampolines that you'd find in a backyard. The most commonly available brands are Aquaglide and Rave Aqua. 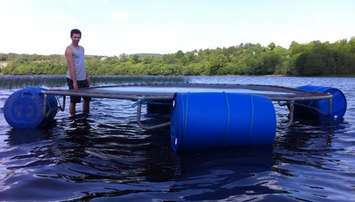 A water trampoline is specifically designed to be used on water. Therefore, you cannot use it on land. Doing so is highly likely to damage your trampoline and is unsafe. Unfortunately, making a homemade water trampoline is extremely difficult. As safety on a water trampoline is extremely important, we highly recommend purchasing a water trampoline specially designed for the job. Covering the inflatable section of the trampoline when it's full of air should help you to find the leak. This is because bubbles will be created at the leak site, making it easier to see. Using a puncture repair kit, you can easily fix the leak by applying a patch a little larger than the hole to the leak site with the glue provided. Be sure to follow the instructions in your repair kit thoroughly to ensure the patch sticks properly. You should wait at least a full day before attempting to re-inflate your water trampoline. If your trampoline is inflated and you want to move it on land, you will need several people to lift the trampoline around the edges and carry it to the edge of the water. Dragging the trampoline is not advisable as it could tear or get a puncture. Once your trampoline is deflated, it should fit easily in a truck for transportation. A water bouncer is easier to take from place to place as it doesn't include a metal frame. Therefore, you can simply fold it up and put it in your car once you've let the air out. On the water, you shouldn't tow your trampoline using a boat because this can cause damage. To safely use a water trampoline, you will need access to water that's at least 8ft deep and 15ft away from any obstacles such as rocks. Most water trampolines can be used in salt water because they are specially treated to be highly durable. However, using the trampoline in salt water can cause metal components like springs to wear out more quickly. Therefore, you will probably find that they need to be replaced more often. If you decide to use your inflatable water trampoline or trampoline raft in the ocean, then it's even more important to anchor it extremely firmly. This is because strong or unexpected water currents or vigorous winds could cause your water trampoline to drift away from the shore. Of course, this would put anyone on board in great danger. Water trampolines are highly durable pieces of equipment. Therefore, you can leave your trampoline out in the water for prolonged periods of time. However, you must first make sure that the lake you are using is happy for you to do this. Also, if there are extremely strong or fast winds forecast, it's probably a good idea to bring in your trampoline. Otherwise, it could blow away or become damaged. Luckily, injuries resulting from the use of water trampolines are rare. However, using the trampoline at the correct depth and distance from any obstructions is key when it comes to avoiding injuries. The trampoline should also be inspected regularly to check that it is in an acceptable and safe condition. In the rare instances where injury has resulted from using a water trampoline, it's usually as a result of safety advice such as this not being followed. As water trampolines are designed to be used in open water, it's also extremely important to make sure that anyone using the water trampoline is a strong and confident swimmer. Always instruct kids in how to use water trampolines safely, check the manufacturer's guidelines to see how many people can use the equipment at once and make sure no one swims under the water trampoline. 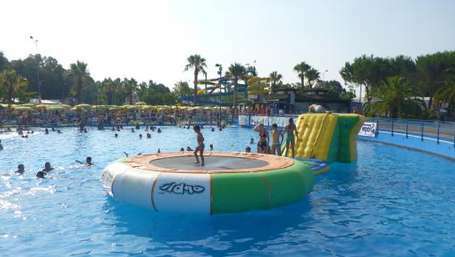 Water trampolines are great fun and you can perform many of the same tricks on a water tramp as on a normal trampoline. These include seat drops, front drops and somersaults. With somersaults, these are only safe with just one person using the water tramp. Hot potato is another fun game to play on a water trampoline. 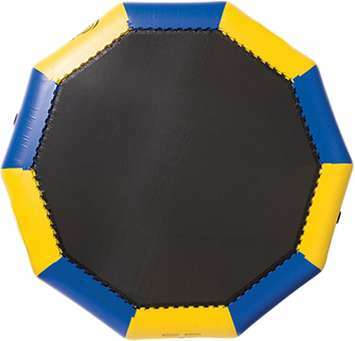 Players try to pass a ball around the trampoline as quickly as possible without dropping it. Follow the leader (or 'Simon says') is another great game, especially for younger children. This involves choosing a leader, who selects a trick or movement for the other players to perform. In the end, the only limit to the games you can play on a water trampoline is your imagination. We bet your kids will come up with a whole host of fun ways to play games on your water trampoline! 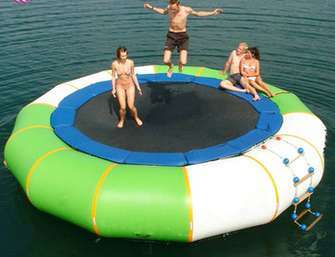 As you can see, inflatable water trampolines can be a great way to have fun when you're visiting the lake or ocean. While they come with a hefty price tag, many people feel that it's worth the investment for the hours of fun a trampoline raft can provide. However, like any trampoline, it's extremely important to inspect it regularly to check it is still in a safe and useable condition. Also, make sure you observe any safety instructions that come with your water tramp and instruct your kids on how to use them safely. This will help to safeguard anyone using your inflatable water trampoline and avoid any nasty injuries. Hopefully, you are now one step closer to enjoying the fun and exercise benefits that come with water trampoline ownership. Have fun, and happy bouncing!